Tour Scotland, Scottish Highland Dancers video, Blackford Highland Games. Tour Scotland, Scottish Pipers video, Blackford Highland Games. Tour Scotland Lomond Hills. 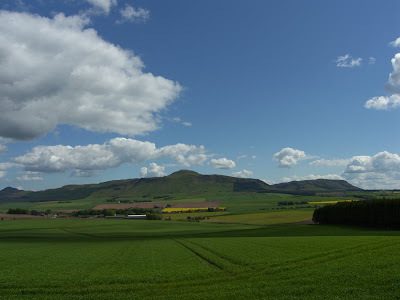 The Lomond Hills, meaning beacon hills, lie in the centre of Fife, Scotland. The Lomond Hills have a rich and varied history. From the Iron Age are the remains of several hill forts, which can be found around the summits of both East and West Lomond as well as at Maiden Castle, a grassy knoll that lies between the two. Tour Scotland Jacobites Video. The Clansmen at Scone Palace, Perthshire, Scotland. Tour Scotland Hopetoun Road. A short video of the road to Hopetoun House, the traditional residence of the Earl of Hopetoun, later the Marquess of Linlithgow. It was built in 1699 and was designed by William Bruce, and extended in 1721 by William Adam. The house is located near South Queensferry to the west of Edinburgh, Scotland. Tour Scotland Laggan Road. A video of a short drive along north bank of Loch Laggan on the A86 road from Kingussie to Spean Bridge. Loch Laggan is a freshwater loch situated east of Fort William, in Lochaber, Highland, Scotland. Tour Scotland, A busker singing in Gaelic on the Royal Mile, Edinburgh, Scotland. Tour Scotland Scottish Small Pipes. Musicians in the Beer Tent at Perth and Kinross Association of Voluntary Service Party in the Park, Perth, Scotland. Tour Scotland Fiddle and Accordion. Musicians in the Beer Tent at Perth and Kinross Association of Voluntary Service Party in the Park, Perth, Scotland. Tour Scotland May River Braan. A video of the River Braan at Rumbling Bridge, just outside Dunkeld, Scotland. This river is a tributary of the River Tay in Scotland. Within the county of Perthshire, it flows eleven miles eastwards from Loch Freuchie, near Amulree, and joins the River Tay near Dunkeld. Tour Scotland Blair Castle Road. A video of the drive to Blair Castle, Scotland. Tour Scotland Castle Bagpiper. A video of the Scottish Bagpiper at Blair Castle, Perthshire, Scotland. Tour Scotland River Tummel Video. A video of the River Tummel, a beautiful river in Perthshire, Scotland. Discharging from Loch Rannoch, it flows east to a point near the Falls of Tummel, where it bends to the southeast, a direction which it maintains until it falls into the River Tay. Tour Scotland Glencoe Drive Video. A video of the drive from Glencoe village into Glencoe, Scotland. A famous glen in the Highlands of Scotland. It lies in the southern part of Lochaber. Tour Scotland Loch Ness Video. A short video taken from the South bank of Loch Ness at Fort Augustus. Loch Ness is a large, very deep, freshwater loch in the Scottish Highlands extending for approximately twenty three miles southwest of the Highland town of Inverness. Loch Ness is best known for the alleged sightings of the legendary Loch Ness Monster, also known as Nessie. Tour Scotland Dunning Road. Enjoy this Scottish video of part of the drive from Path of Condie to Dunning, Scotland. Tour Scotland. The road from Rhynd to Elcho Castle, Perthshire, Scotland. Tour Scotland Kirking of the Council, Perth, Scotland. This year’s Kirking of the Council took place on Sunday 10th of May 2009 in St John’s Kirk of Perth. A procession of Councillors and senior Council officials, joined by the Lord Dean of Guild, flanked by the High Constables and led by Perth and District Pipe Band, left at 10.30am from the foot of Perth High Street and proceeded to the Kirk via Tay Street, South Street, St John Street and North St John’s Place. Tour Scotland Bagpiper River Tay. A Scottish bagpiper playing by the River Tay, Perth, Perthshire, Scotland. Tour Scotland Rainy Day in May. Lots of rain today in Perth, Scotland. A short video taken beside the River Tay, looking over towards Tay Street. Tour Scotland, The organist rehearsing today at St. John's Kirk of Perth, St John's Place, Perth, Perthshire, Scotland. St. John's is a congregation of the Church of Scotland, part of the Reformed tradition, and welcomes everyone to its Services. 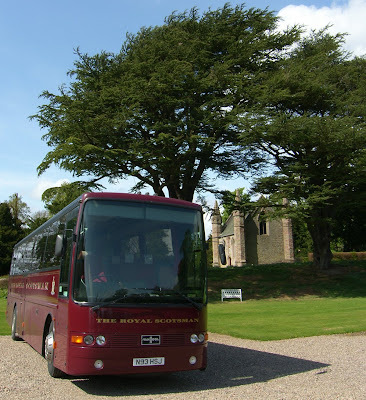 Tour Scotland, Royal Scotsman Coach at Scone Palace, Pethshire, Scotland. Tour Scotland Tay Valley. 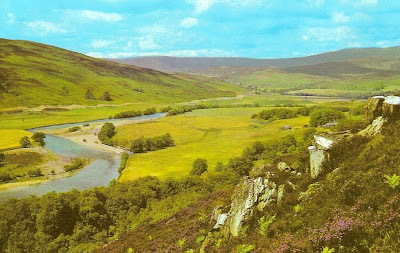 A short panoramic video of the Tay Valley and River Tay just South of Perth, Perthshire, Scotland. Tour Scotland Scone Driveway. A video of the drive from the main road up to Scone Palace, Perthshire, Scotland. Tour Scotland Holy Blood Aisle. In the Holy Blood Aisle, of St Giles' Cathedral, Edinburgh, you can light a candle and also write a request for prayer. Tour Scotland Crail Potter. The family businesses of Crail Pottery, Crail Earthenware and Crail Ceramics produce a diverse range of stoneware and brightly coloured earthenware, from cooking pots to mugs, and salad sets to garden pots. Every item is hand thrown, decorated and glazed on the premises. Tour Scotland Glasgow Quire. The Quire of Glasgow Cathedral dates from the middle of the 13th century. The seating is arranged with the pews facing east in manner of Reformed worship. These pews, together with the carved stalls in the in the north and south aisles were originally installed between 1851-1856. Tour Scotland Guildtown Bagpiper. A young piper at Guildtown, Perthshire, Scotland. A wee May video of Dunnottar Castle, Scotland. 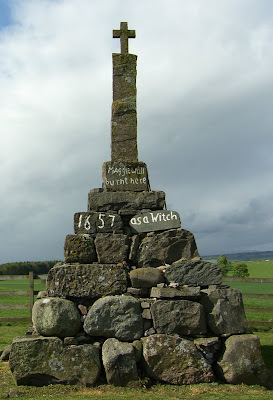 Tour Scotland Witch Memorial near Dunning, Scotland.